The knife in most cases is any outdoorsman”s best friend. Heck, I never the leave the house without some sort of knife on me even if its for a jog. If you watch any of those survival shows on TV, you will really see how important and versatile a good knife can be. Most of us never have to worry about being in those circumstances, but keeping a good knife around for that “just in case” scenario is always a good idea. For the standard outdoorsman, the knife is our do-all tool. Besides being a knife and cutting what needs cut, they get used for chopping down trees, opening cans of stew, tightening screws, hammering nails or getting in that coconut on the deserted beach or cutting trees for a new recliner like on jcer.info. Its the one tool that is always by our side and therefore gets picked first to try every job. The Satori Tanto from Three Circles Knives is a knife I wouldn’t mind taking with me for when I get stranded in the jungles we have in Illinois or I guess those little ones in South America also. These knives are built for abuse and the will take whatever coconut or washed up car tire you throw at it. The pictures don”t show you just how tough these knives are. They are thick and heavy and not in a bad way. This is a one-piece body made out of 1/4″ Steel and they didn’t take much off of that to give you the blade. It will cut trees with the best of them and still gut that croc when needed. “Satori” means Enlightenment in Japanese and we found this to be a fitting name for our first knife as it represents our attitude going forward with our knives. The Tanto blade has a long history in weaponry. Worn by the warrior class of feudal Japan, it made its way to America in the 1980″s and is a common blade pattern for tactical knives due to its excellent stabbing ability from a reinforced tip. 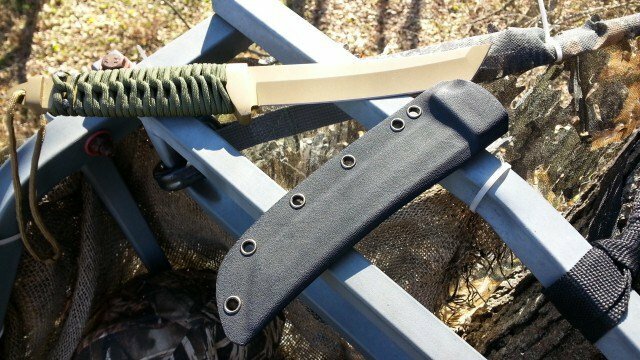 Our Tanto blade is ground on both sides and is made to be used. Below are the carry options that are listed on the Three Circles Knives website. Our Satori Tanto has multiple carry options using the provided MOLLE clip and paracord. These carry options include belt and shoulder carries. Below are pictures of examples of the different carry options. My overall opinions of the knife. As I mentioned above, this is a knife you really need to have in your hand to really fall in love with it. It will do all I mentioned above and then some. But, nothing is perfect. I did have a couple of minor issues. The knife itself is great. I would really like to see a thicker grip. I like the paracord grips but I think an extra layer of cord wrapped underneath would make a big difference in the actual feel of the knife. That is a personal preference issue as I know a lot of people like the thinner handle as well. My other issue is with the sheath. The knife fits perfectly in the sheath and once it”s in there, it”s not coming out. But, it comes with a screw on clip that is to be used to attach it to your belt. You can see the clip in the pic above. When the clip is installed on the sheath in the spots provided, it positions the knife high around the waste. My only issue with that is there is no option to carry in a lower position like most standard sheaths. Again, that is my personal preference and may not be a problem for you. Overall, I am going to give this knife an 8 out of 10 and that’s because of the sheath mounting and thin grip.